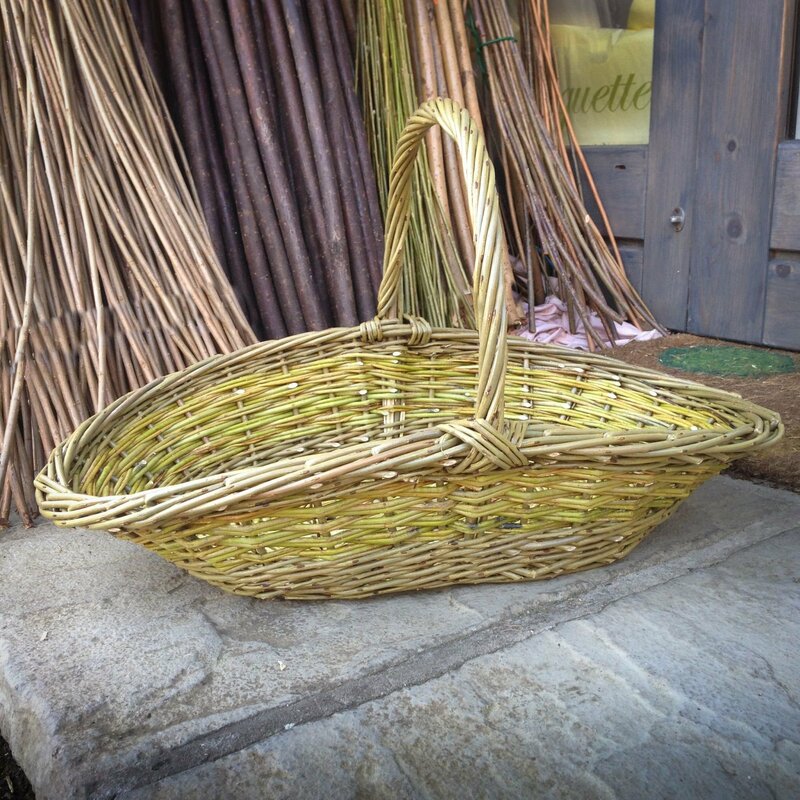 I can still remember the day when my curiosity about basketmaking began – a demonstrator at The Eden Project in Cornwall was showing visitors how to weave some blades of grass into the beginnings of a simple basket. How intriguing! . . . to be able to create something so useful out of something so commonplace . . . ? 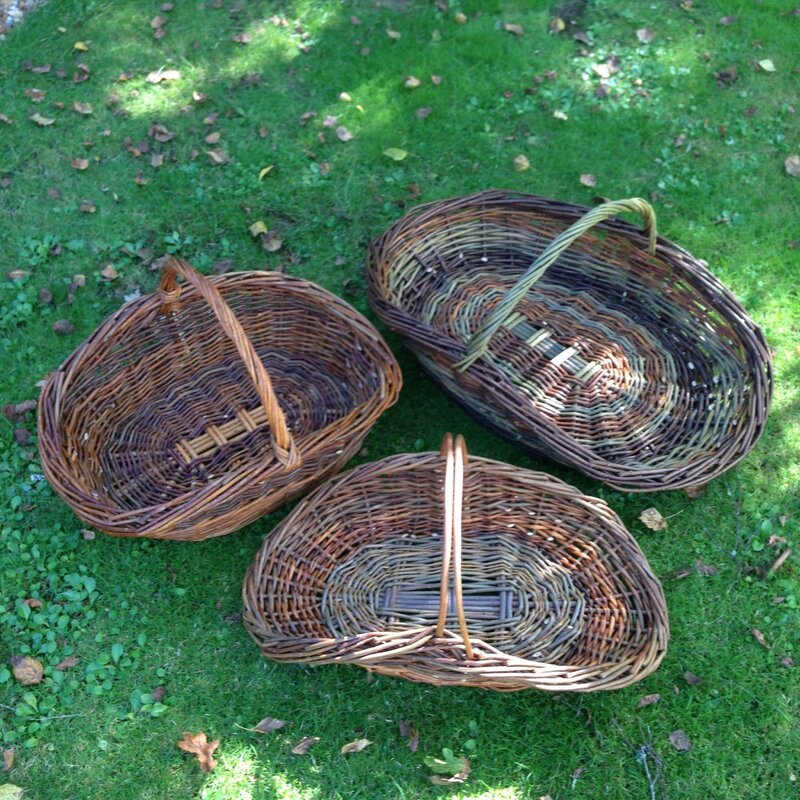 When, a few weeks later, I saw an advertisement for willow basketmaking classes I simply had to enroll! From that moment I was hooked. The possibilities for creativity out of, essentially, a pile of sticks were endless and I just had to learn the techniques. 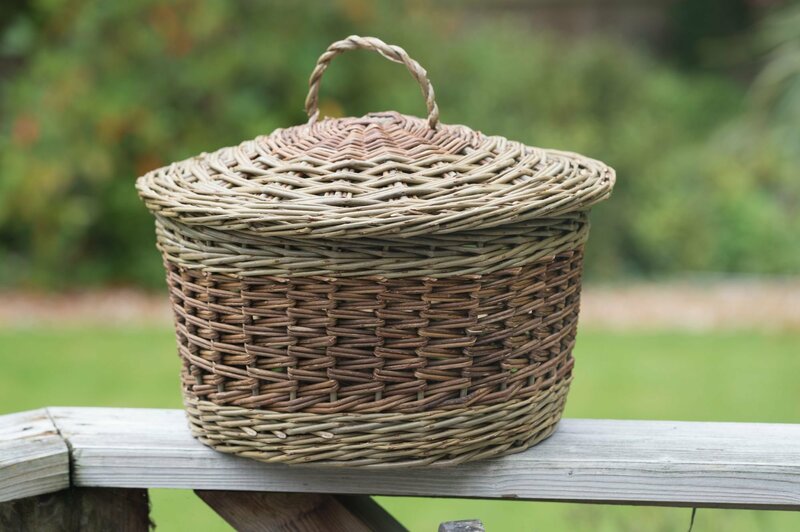 I joined the Basketmakers' Association which opened my eyes to the incredible diversity within basketry, both traditional and contemporary, and to the many makers in this country and overseas. 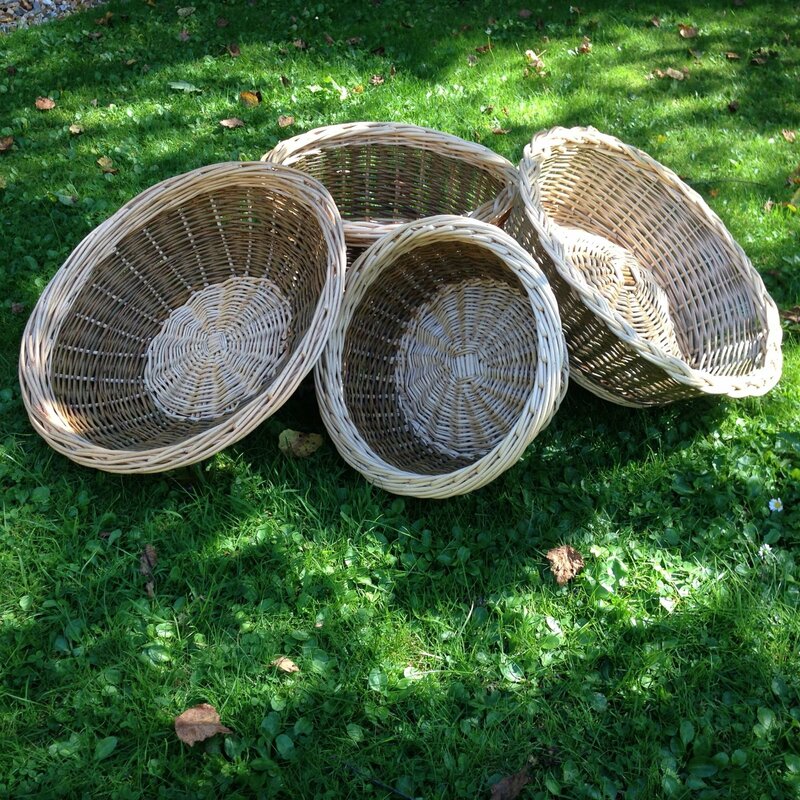 That was back in 2002 and since then I have deepened my knowledge through attending as many workshops and courses by as many different basketmakers as I could find or afford! The City Lit College in Covent Garden, West Dean College near Chichester and Westhope Craft College in Shropshire have all provided me with inspirational teachers and teaching. 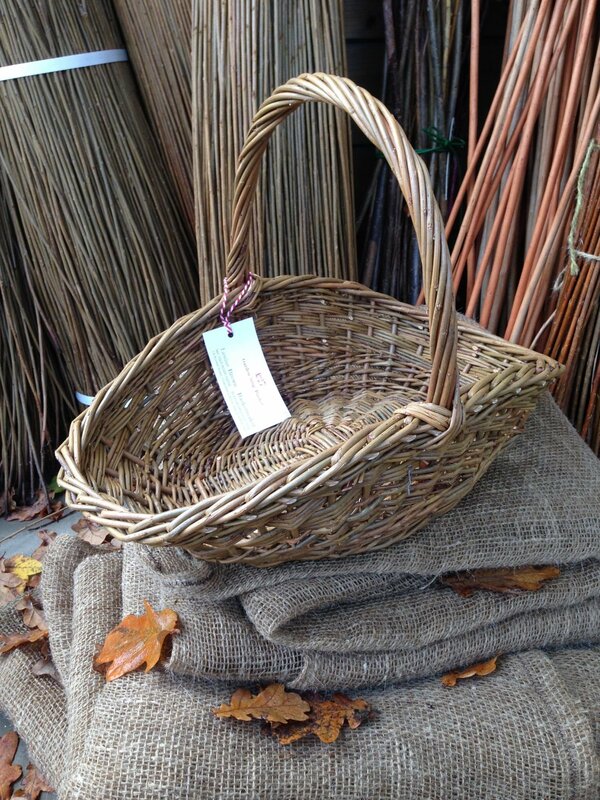 In 2016/17 I completed the City & Guilds course in Basketry at Westhope. Gaining this qualification gave me the confidence to share my passion with others through teaching and I now run workshops in Hampshire and the surrounding areas, including adult education classes in Winchester. I hope I can encourage you to join me on one of my workshops so that you too can experience the pleasures of this ancient and sustainable craft. Or if you have someone special in your life who would appreciate attending a workshop, I offer gift vouchers; just drop me a line. 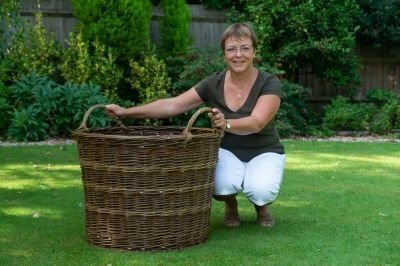 I also display and sell my baskets at a handful of garden and Christmas fairs around my home area in Hampshire, including past participation in the annual Hampshire Open Studios event. My upcoming events are listed under Events & Shows. 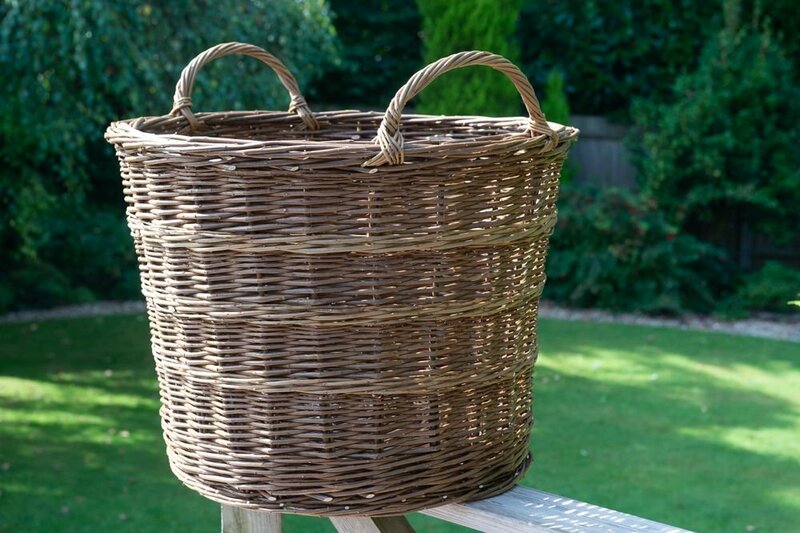 If you have any questions, or just want to chat about baskets, do get in touch via the Contacts page. Spring 2019 Workshops temporarily postponed . 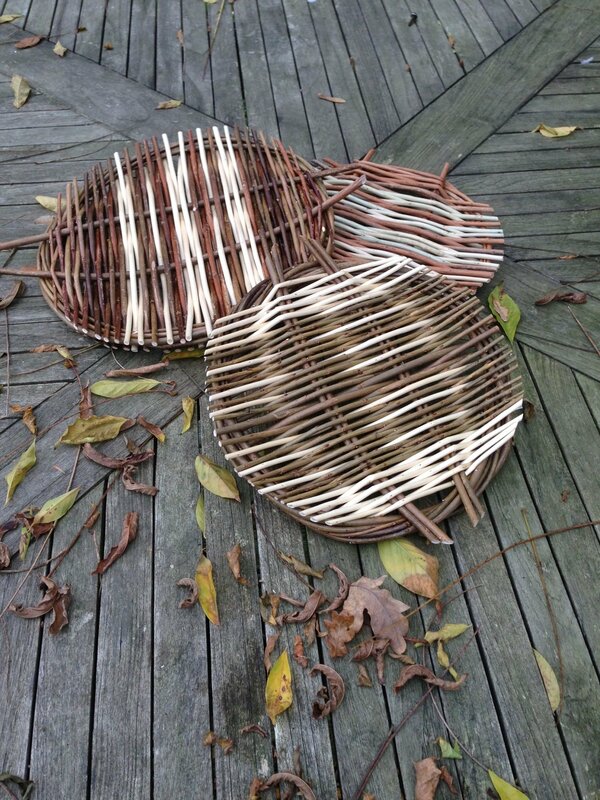 . .
Whilst I am running a handful of workshops for Winchester Adult Education this Spring (see under "Also Teaching at . . . ") I am holding off publishing any of my usual workshops for the start of 2019 as I am in the process of moving house (and workspace) and do not want to commit to any classes that I may later have to cancel. Please be assured I will be resuming normal service later in the Spring when I am settled into my new place! If you are on my mailing list already, I will be sending you information automatically. If you would like to be included on my mailing list just send me a note via my Contact page. If you would like to book me to run a private workshop for you and a group of friends, please do get in touch as I may still be able to accommodate this. A full day of Christmassy creations! Make a nordic reindeer (2-D, not a 3-D sculpture, which would be a bit ambitious! ), Christmas Trees and a few stars if time allows. Pace and quantity of creations will be dictated by you! 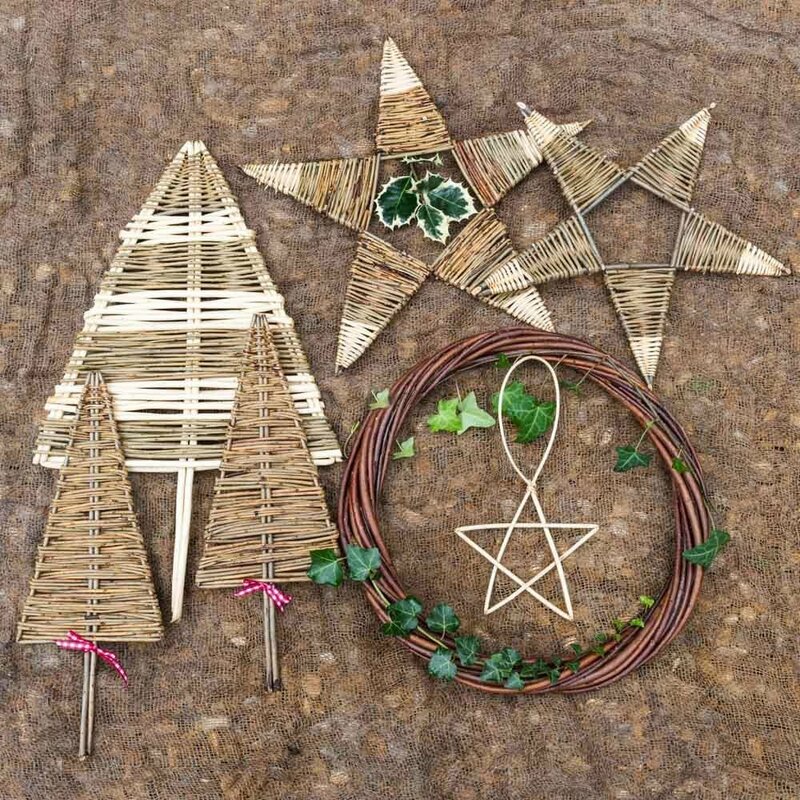 Part of a 3-day Festive Weekend, 23-25 November, making willow Christmas decorations: six half-day workshops covering three individual topics. One half-day workshop £30, additional half-day workshops £25. This Sunday afternoon workshop is: CHRISTMAS TREES (repeated on Friday morning). 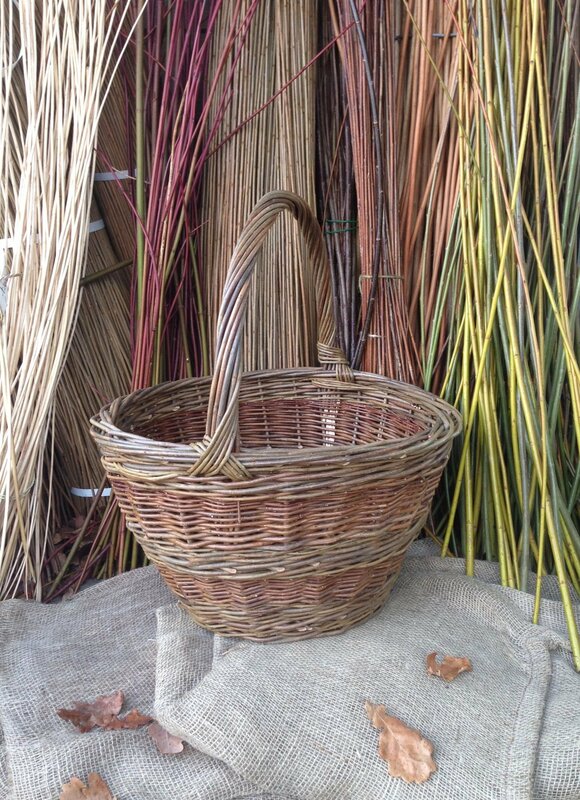 Part of a 3-day Festive Weekend, 23-25 November, making willow Christmas decorations: six half-day workshops covering three individual topics. One half-day workshop £30, additional half-day workshops £25. This Sunday morning workshop is: REINDEER (repeated on Saturday afternoon). 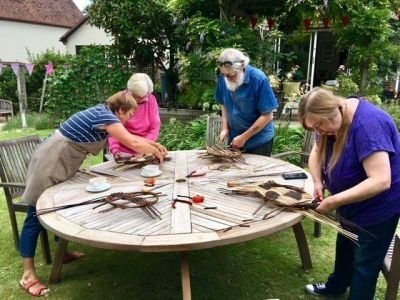 Part of a 3-day Festive Weekend, 23-25 November, making willow Christmas decorations: six half-day workshops covering three individual topics. One half-day workshop £30, additional half-day workshops £25. This Saturday afternoon workshop is: REINDEER (repeated on Sunday morning). 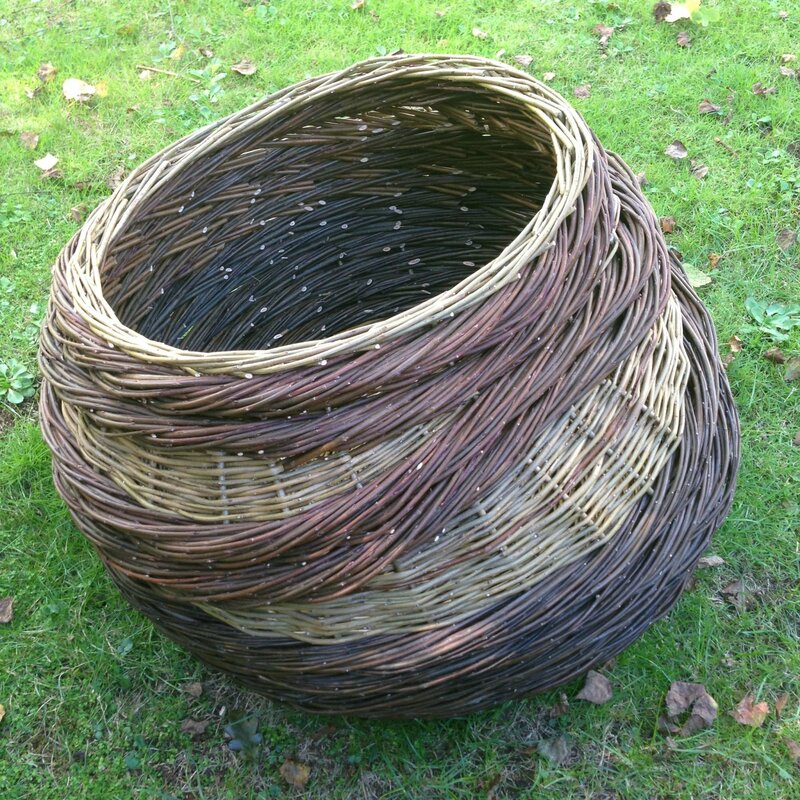 Part of a 3-day Festive Weekend, 23-25 November, making willow Christmas decorations: six half-day workshops covering three individual topics. One half-day workshop £30, additional half-day workshops £25. This Saturday morning workshop is: STARS (repeated on Friday afternoon). 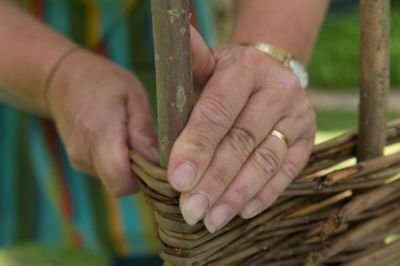 Part of a 3-day Festive Weekend, 23-25 November, making willow Christmas decorations: six half-day workshops covering three individual topics. 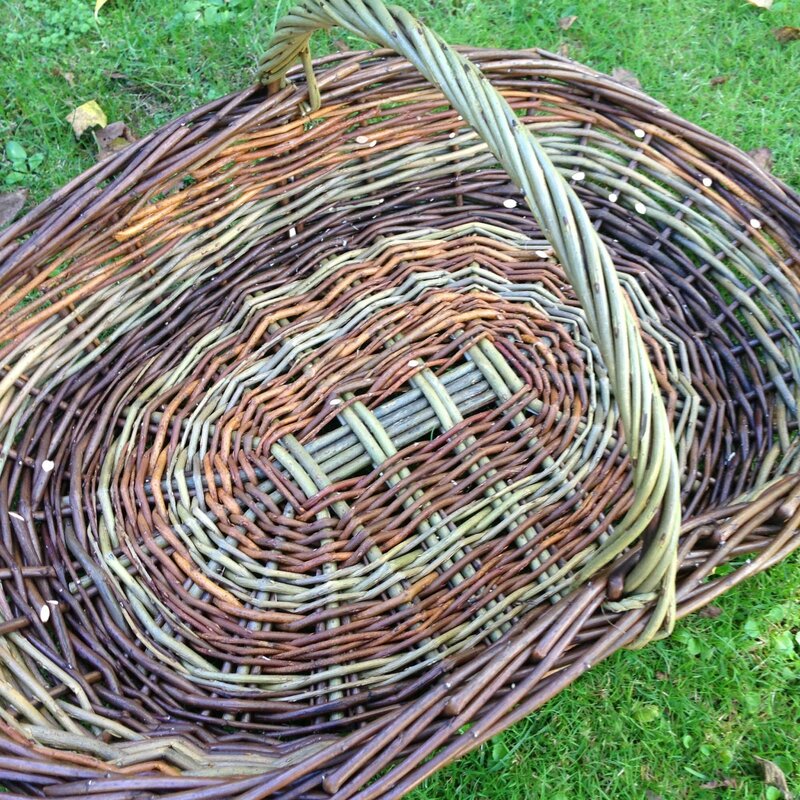 One half-day workshop £30, additional half-day workshops £25. This Friday afternoon workshop is: STARS (repeated on Saturday morning). 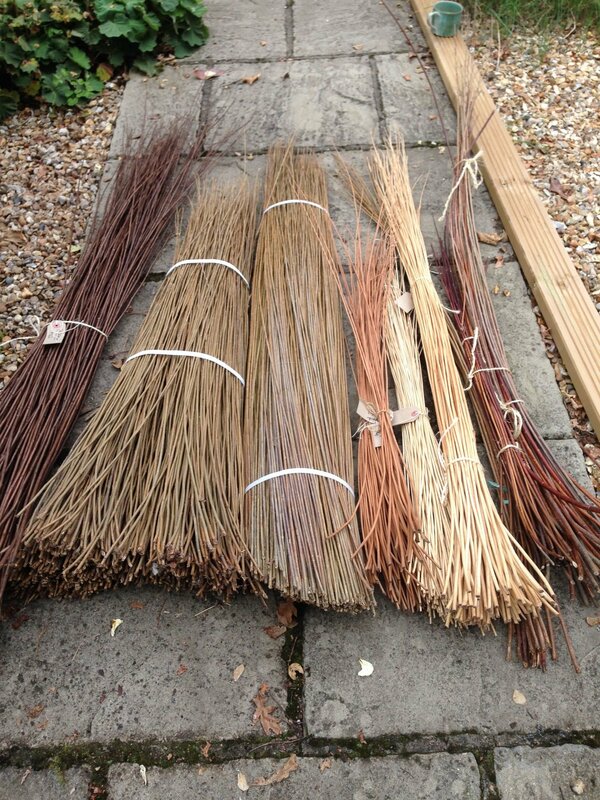 Part of a 3-day Festive Weekend, 23-25 November, making willow Christmas decorations: six half-day workshops covering three individual topics. One half-day workshop £30, additional half-day workshops £25. This Friday morning workshop is: CHRISTMAS TREES (repeated on Sunday afternoon). This type of platter, or 'tension tray', is surprisingly quick and easy to learn and create - so you will certainly be able to make more than one during this workshop, allowing you to experiment with different colours, shapes and handles. Use your finished platter for serving/displaying fruit, mince pies (my favourite! 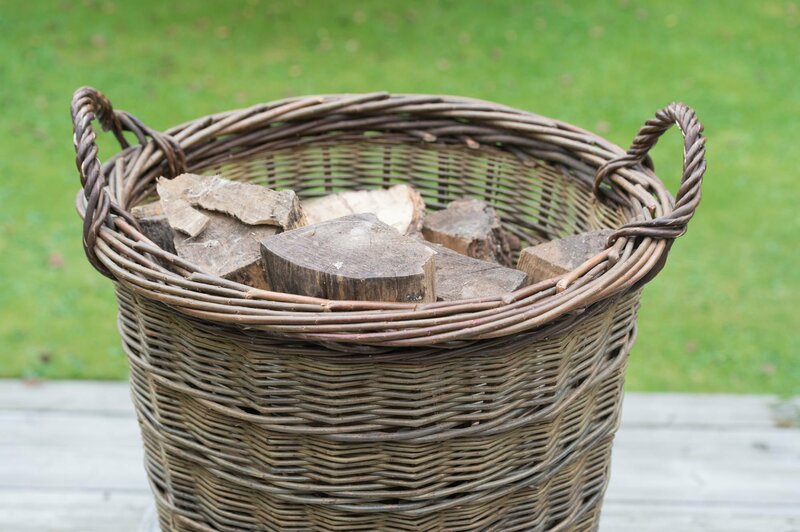 ), bread, etc; or as a trivet for hot pots and pans; or simply display it as a thing of beauty! NB: This workshop is also available at Winchester Adult Education, Weeke, on Friday 19th October - see “Also Teaching at …” tab. 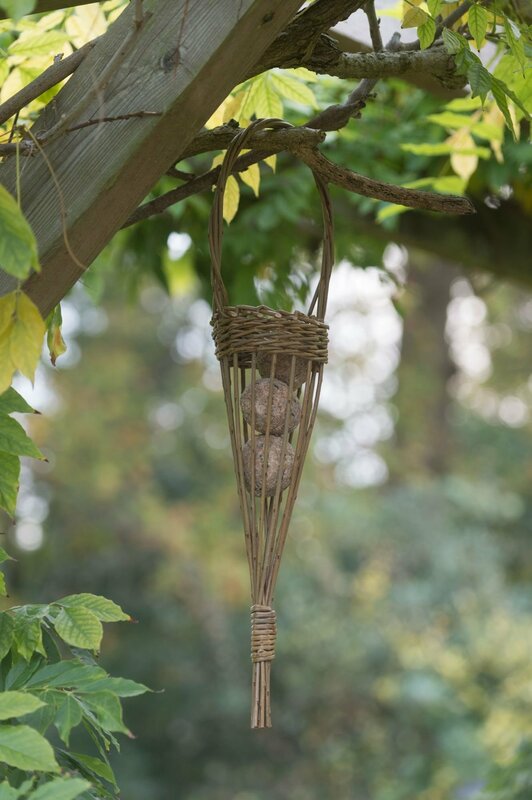 Make an attractive woven-willow bird feeder that can be hung from a tree branch or hook in your garden. Fill with fat-balls (provided) and enjoy watching the birds feed, knowing you are helping them survive the winter months. You will probably manage to make two bird feeders during this workshop, so one for you and one for a friend: a great Christmas present! 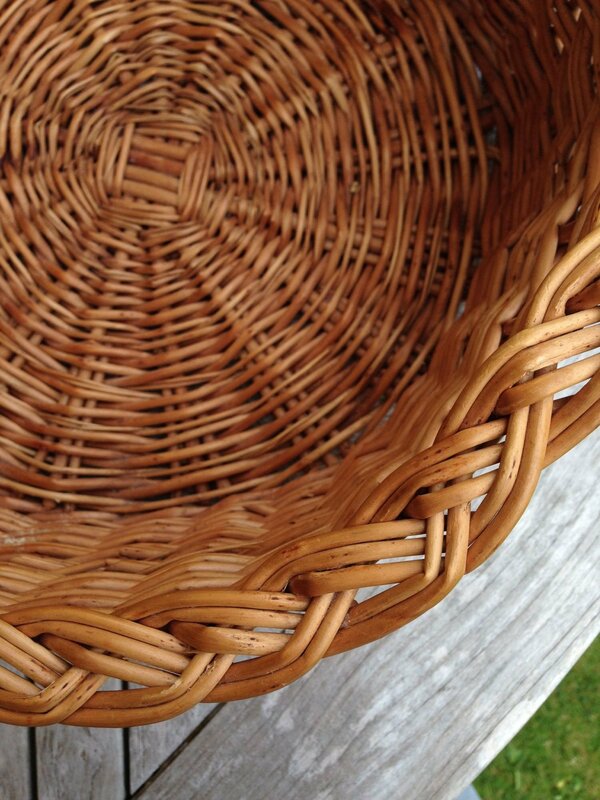 This Bread Basket is an ideal introduction to basketmaking. 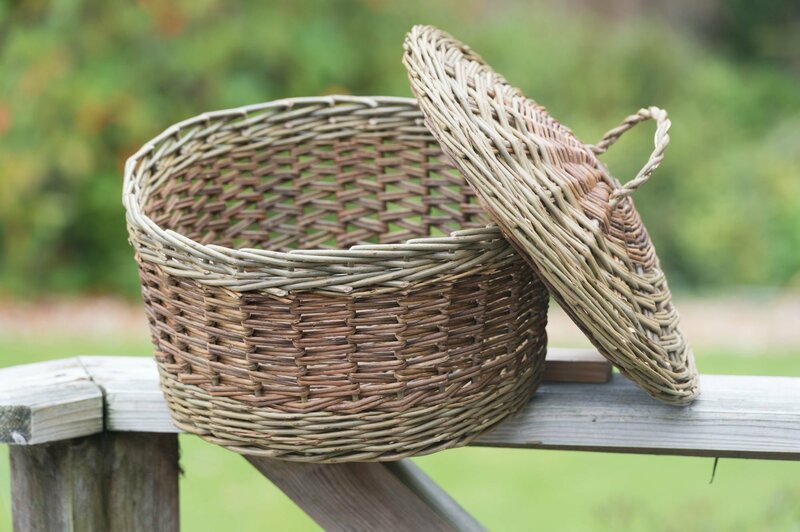 You will learn fundamental basketry skills: how to weave a round base; the insertion of side stakes and weaves around them; and finally a simple border to finish off. NB: This workshop is also available at Winchester Adult Education, Weeke, on Tuesday 2nd October - see “Also Teaching at …” tab. 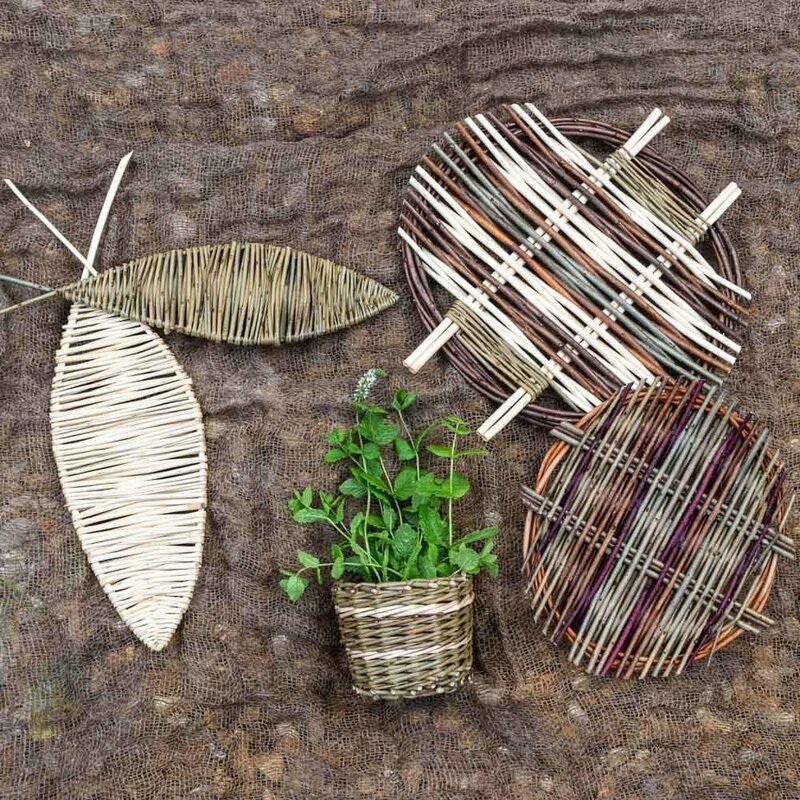 This sweet little basket introduces lots of traditional basketry techniques and is simple enough to complete in a day. 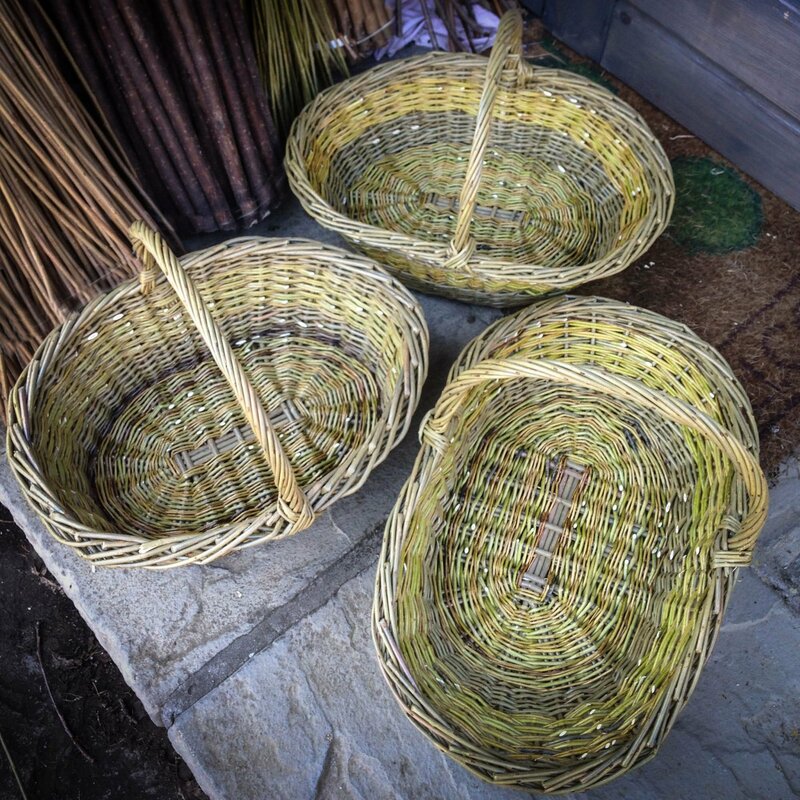 The techniques learned will provide a grounding for more complex basketry projects. NB: This workshop is also available at Winchester Adult Education, Weeke, on Friday 15 June - see “Also Teaching at …”. 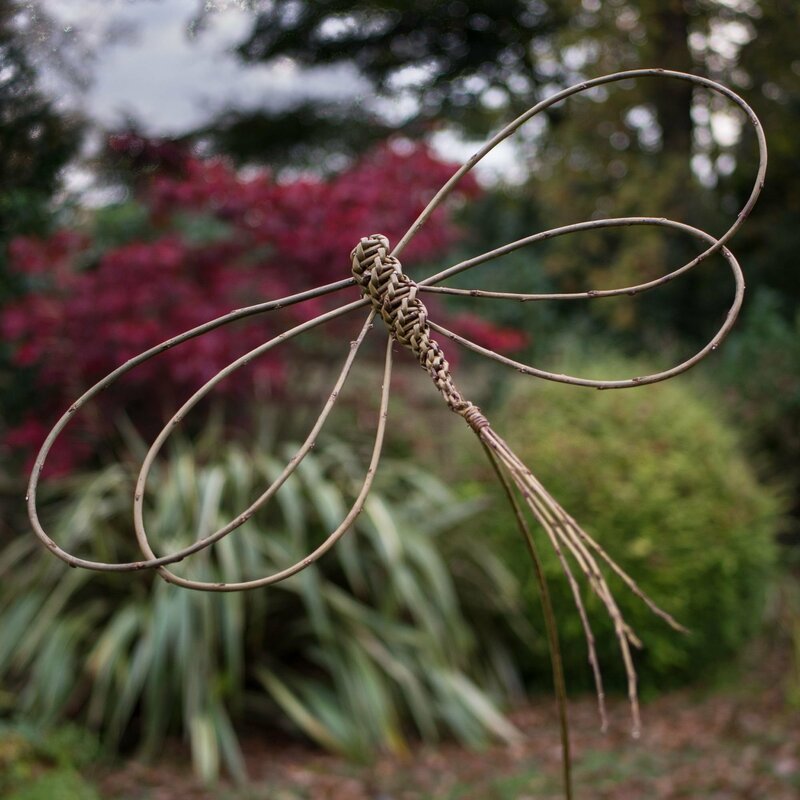 Enhance your garden pots and borders with willow dragonflies that gently sway in the breeze, and willow sunflowers to brighten a shady corner or place against a wall. 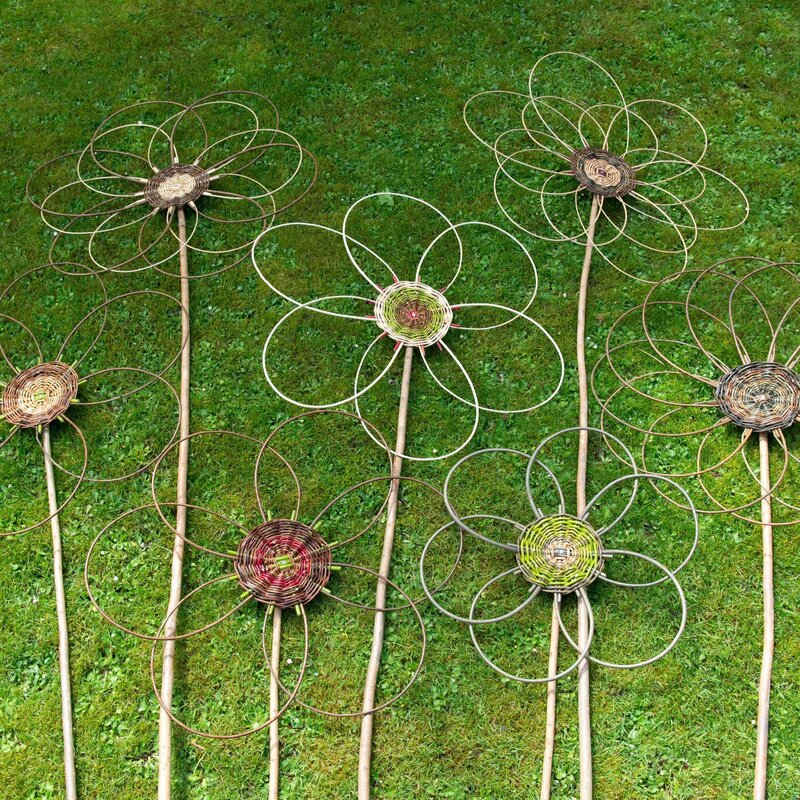 The technique used for creating the sunflower is a stepping stone to creating the base of a traditional round basket. NB: This workshop is also available at Winchester Adult Education, Weeke, on Saturday 12 May - see “Also Teaching at …”. 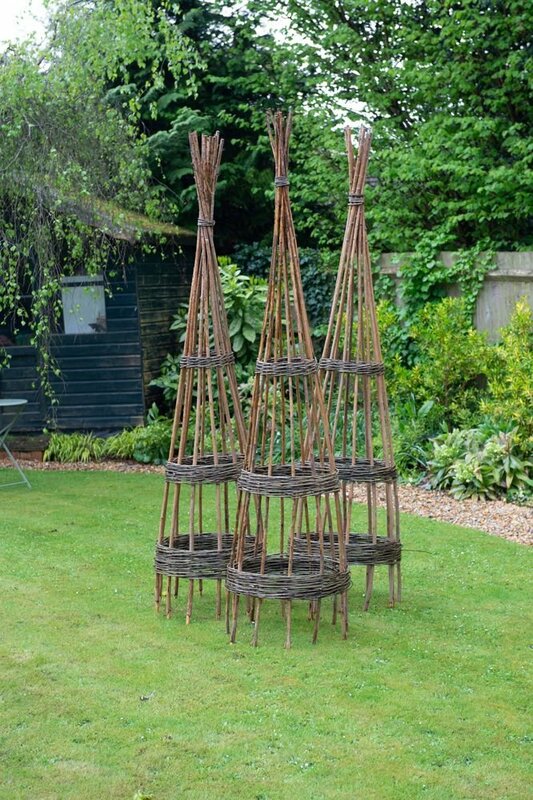 You will make a large wigwam support suitable for training beans and flowering climbers, as well as a smaller one that can fit into plant pot. You will complete at least one of each size during the day, possibly more if you are a quick worker! WARNING make sure you have room in your car to transport your finished wigwams! - the tallest size could be 8'. NB: This workshop is also available at Winchester Adult Education, Weeke, on Saturday 21 April - see “Also Teaching at …”. 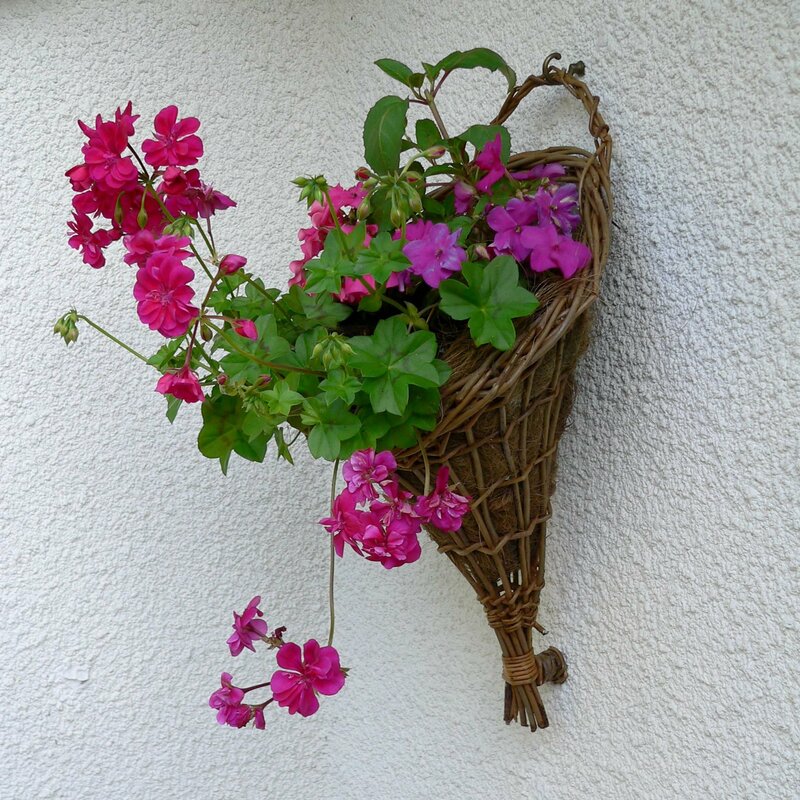 You will make a beautiful self-supporting planter ready for your sweet pea seedlings. The planter holds a large plastic plant pot (provided) to accommodate 6-12 seedlings which will happily scramble up the supports. 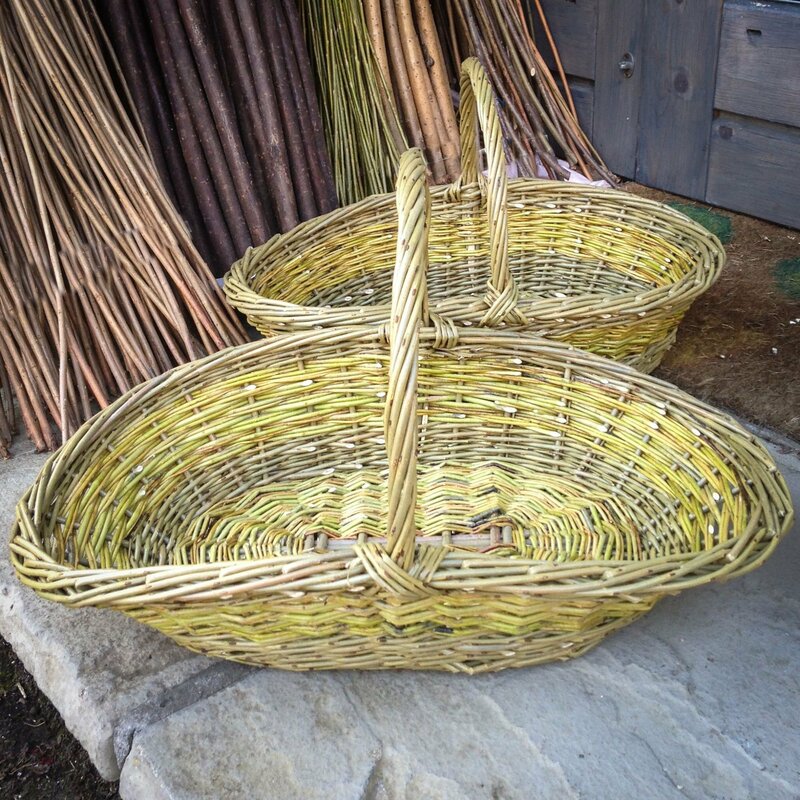 This workshop will introduce key basketry techniques which will be a stepping stone to more complex basketmaking projects. NB: This workshop is also available at Winchester Adult Education, Weeke, on Sunday 4 March - see “Also Teaching at …”. 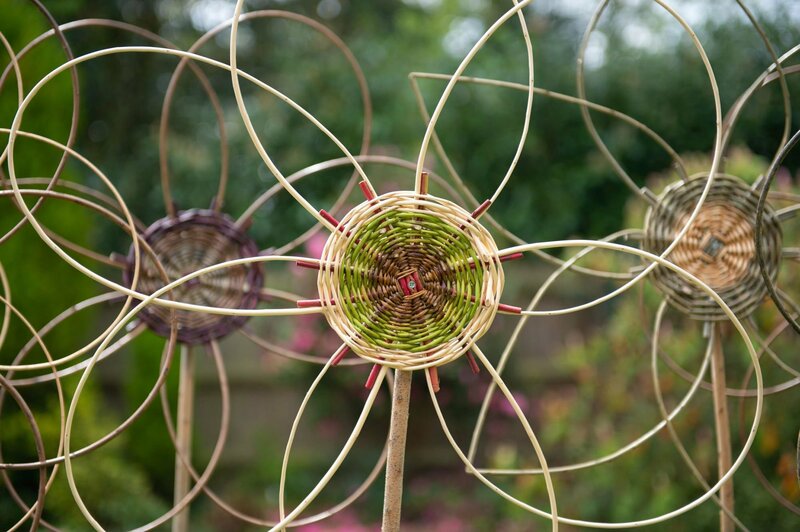 Dispense with ugly plastic or wire bird-feeders and make some natural willow birdfeeders to enhance your garden and keep the birds happy during the winter months. 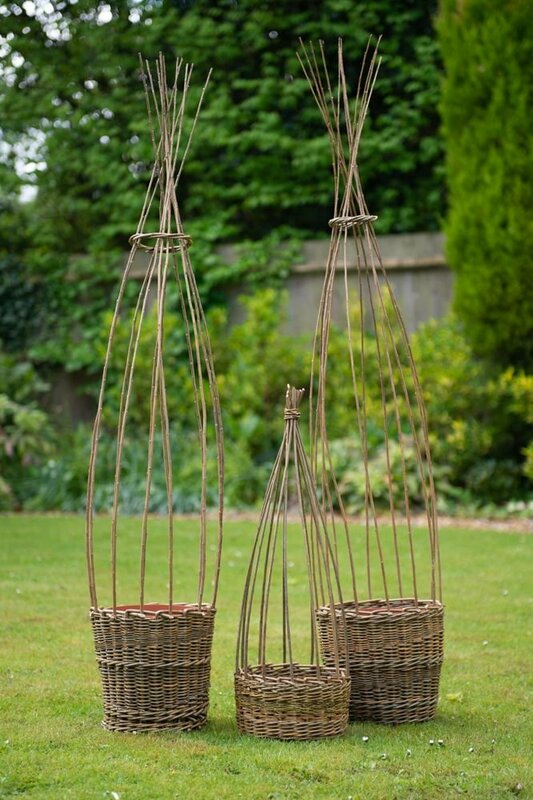 You will make two different designs of willow bird feeder, one can be hung in a tree, as with the fat-ball bird feeder shown in the photograph here, or staked into the ground and filled with seeds. NB: This workshop is also available at Winchester Adult Education on Saturday 3 February - see "Also Teaching at ..." for more details. 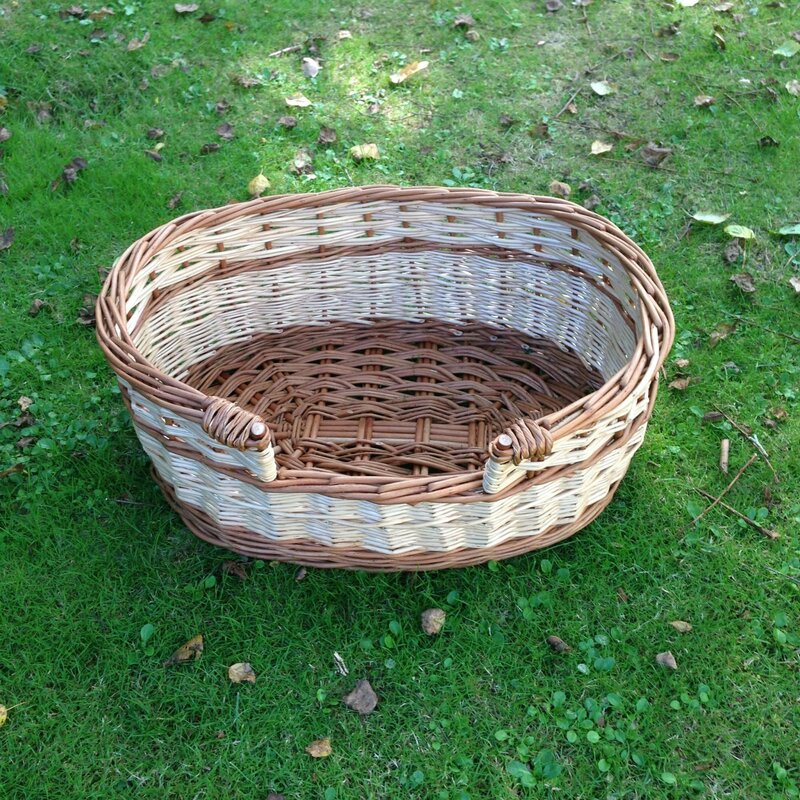 Traditional round basket with handle, heavyweight and strong - suitable for gathering apples. 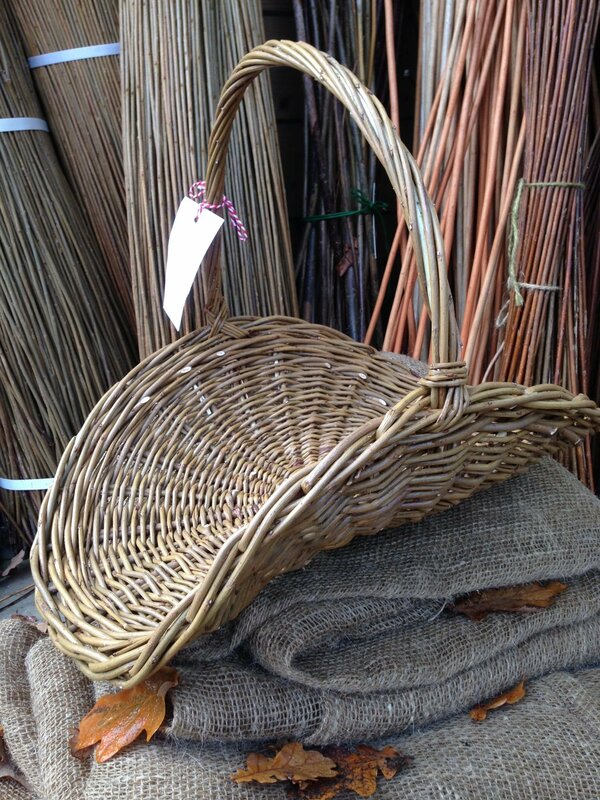 Uses two varieties of brown willow.